BBC World News NUJ Chapel notes that China Central Television (CCTV) is opening its largest media hub outside China in Chiswick, employing over 300 staff. According to Reporters Without Borders, China’s state and privately-owned media are under the Communist Party’s close control, while foreign reporters are encountering more and more obstacles. More than 50 journalists and bloggers are currently detained. This NUJ Chapel condemns moves to deepen control by the Chinese Communist Party of news and information and the online surveillance of its citizens. We also condemn how forced televised confessions, filmed and broadcast by CCTV, are now commonplace in China. This Chapel therefore supports the complaint filed by victim and former Reuters journalist Peter Humphrey with OFCOM against CCTV for operating in violation of the regulator’s broadcasting code and for complicity in committing gross human rights violations. This Chapel states that broadcasters cannot be accomplices to torture. 21 December 2018 – The human rights organisation Safeguard Defenders has learned today that BBC television journalists have moved a resolution condemning China’s state broadcaster CCTV over its airing of forced confessions from China in the UK and supporting the recent complaint to Ofcom of victim Peter Humphrey against Chinese TV’s involvement in this human rights abuse. Mr. Humphrey, a former Reuters correspondent for almost 20 years and then due diligence consultant for 15 years in China, submitted a detailed complaint to Ofcom on 23 November calling for curbs on CCTV’s UK broadcast rights due to CCTV’s role in extracting and broadcasting forced and falsified “confessions” from him and his wife twice (in 2013 and 2014) while they were held under duress in a Shanghai jail on false charges of illegally acquiring private information. Ofcom is the UK broadcasting regulator which enforces UK broadcasting laws. Mr. Humphrey’s complaint has pinpointed 15 violations of this law by CCTV in its broadcasting of his forced “confession”, centering around CCTV’s violation of the law’s privacy and fairness provisions and the standards of content. Ofcom has yet to reach a decision on Mr. Humphrey’s complaint. Mr. Humphrey, a British citizen, and his American wife Yingzeng Yu, were incarcerated in Shanghai from July 2013 to June 2015, and Mr. Humphrey was denied medical treatment in captivity, causing cancer. Safeguard Defenders welcomes the principled decision taken by BBC journalists trade union, the National Union of Journalists (NUJ), convened on Friday. This resolution upholds professional ethics and journalistic values against the encroachment of abusive media practices employed by CCTV, an arm of the Chinese Communist Party. “We call upon all journalists in the UK to act in concert with this move by the NUJ group at the BBC”, Safeguard defenders director Peter Dahlin said. Friday’s resolution (above) was adopted by the television arm of the NUJ in BBC Global News. A group of 14 NGO’s call for Huang Qi’s release and access to medical care. 2018-11-05 — Chinese authorities must immediately and unconditionally release citizen journalist and human rights activist Huang Qi, a group of 14 NGOs said on November 5, 2018. Huang Qi (黄琦), the founder and director of 64 Tianwang Human Rights Center, is not receiving adequate medical care in detention and his health has seriously deteriorated, according to his lawyer who visited him on October 23. Huang’s condition is so serious that there is an immediate threat to his life. The Chinese government must immediately and unconditionally release Huang, who has been detained solely for the peaceful exercise of his right to freedom of expression, and end its policy of denying prompt medical treatment to prisoners of conscience, which is a form of torture. Several human rights defenders and ethnic and religious minorities have died in detention in recent years due to a lack of prompt medical treatment, including Liu Xiaobo, Cao Shunli, Yang Tongyan, and Tenzin Delek Rinpoche, intensifying fears that Huang Qi might suffer the same fate without urgent intervention. Huang suffers from a chronic kidney disease which requires daily medication, hydrocephalus (accumulation of fluid in the brain), heart disease and other illnesses. Huang told his lawyer during the October meeting that Sichuan authorities had purposely understated the dire state of his health and had tried to cover up his actual condition. In particular, Huang’s blood pressure was actually much higher than previously revealed, with a reading done on October 18 and 19 in the detention facility measuring 221/147 mm Hg, a reading so high that it qualifies as a “hypertensive crisis” (a normal reading should be no higher than 140/90 mm Hg). Huang has also reported to his lawyers different forms of torture and other ill-treatment to which he has been subjected to in the past two years, including extended interrogations, prolonged periods of being forced to stand, and beatings. Lawyers representing Huang Qi have also faced retaliation. One of his lawyers, Sui Muqing, was disbarred in February 2018 for defending human rights defenders, such as Huang. Huang’s current lawyer, Liu Zhengqing, received a notice in October that he is under investigation for giving Huang cigarettes during a meeting in July. Liu faces suspension of his law license or a large fine. Tomorrow, during China’s 3rd Universal Periodic Review, UN Member States should raise the continued pervasive use of torture and other ill-treatment in China, including tactics like denying medical care for human rights defenders, and make clear calls on the Chinese government to end such practices. Mianyang City police in Sichuan Province initially detained Huang Qi on November 28, 2016 and arrested him the following month on charges of “illegally providing state secrets to foreign entities.” A trial scheduled for June 20, 2018 was suspended without any official reason provided. In October 2018 police added an additional charge of “leaking state secrets.” He is currently being held at Mianyang City Detention Center. 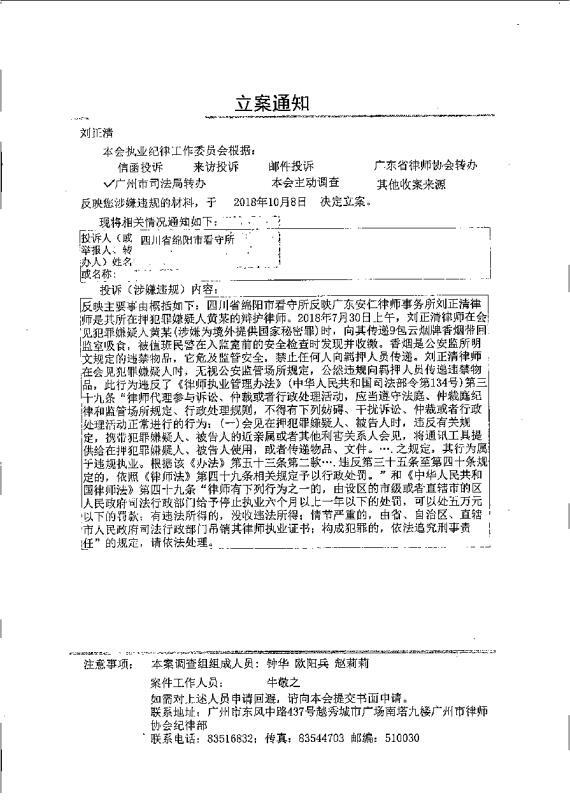 Huang Qi established China’s first-known human rights monitoring website in 1998, disseminating reports about Chinese individuals who had been trafficked and disappeared. Huang has served two prison sentences, totalling eight years, in reprisal for his human rights work, and was often tortured and otherwise to ill-treated. Born in 1963, Huang Qi graduated from Sichuan University and was formerly a businessman. His work in citizen journalism has received international awards, including two from Reporters Without Borders, which awarded 64 Tianwang the Press Freedom Prize in 2016, and honored Huang in 2004 with the Cyber-Freedom Prize. State-sanctioned enforced disappearances are not new in China, but since 2013, the police have the right to disappear someone, hold them in solitary confinement, and deny them access to family and lawyers for up to six months. Zhao is talking from Taipei where she recently published a new book about women activists, social movements and political repression in China called 她们的征途 (Her Battles in English). They maintain the secrecy, she says, as a cloak to buy time. “If they don’t inform the family, they can keep them for longer.” But this lack of information is unbearably cruel on loved ones. “Why do they add that extra layer of cruelty by keeping the family in the dark?” she asks. She points to the largely unreported case of Zhao Suli (赵素利), the wife of dissident Qin Yongming, who disappeared without a trace more than three years ago. “No one talks about this case – her children can’t find her – she just disappeared…We’re afraid some accident happened to her. Maybe she just died under RSDL. The police are allowed not to tell families where they are being held so you can just disappear people this way. Since this interview Zhao Suli has resurfaced – she was allowed a brief visit with her family in early February but is still not free – she is now being held at her own home, according to this report by Radio Free Asia. Zhao Sile has spent many months interviewing the wives of the 709 lawyers, many of whom were victims of RSDL, and for Her Battles she also talked with NGO worker Kou Yanding (寇延丁) who spent 128 days in RSDL (for an extract from Kou Yanding’s own book about her ordeal please see Kou Yanding: You must get our approval for everything). Kou, she said, was still so distressed from her RSDL experience that she found it difficult to talk about it at length, even though several years had passed. Several of Zhao’s friends have also been disappeared, she says sadly, so she has first hand experience of this fear. Zhen, an online human rights campaigner, was detained on 1 September last year, and is now being held under RSDL on suspicion of inciting state subversion. The latest news in Zhen’s case came in early February, when his lawyer said his application to see Zhen had been denied. Zhao describes how activists, like Zhen before he was detained, have been trying toughen themselves up so they can cope better with the torturous experience of RSDL. But however terrible RSDL is, laments Zhao, the world is not paying attention so books like our The People’s Republic of the Disappeared (11 first person-accounts of RSDL), are crucial. The fact that the world is not paying attention is “terrifying,” she says. “[German leader] Angela Merkel is now looking away but many people thought she was one of the few leaders that would not look away, that she would care about human rights. And Norway – they didn’t say anything about [Chinese dissident] Liu Xiaobo (刘晓波) even when he was dying in prison.